The Hardy Compound (Matt Hardy), The Bottomless Pit (Boogeyman), Death Valley (The Undertaker), The Iron Gates of Fate (Kevin Sullivan), Parts Unknown (The Ultimate Warrior), Nastyville (Nasty Boys), The Wyatt Compound (Bray Wyatt), and The Penalty Box (The Goon). 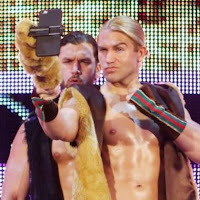 - Last night at an NXT live event in Jacksonville, Tyler Breeze made a surprise appearance where he defeated Marcel Barthel. After the match, Breeze gave a post-match speech and said he hadn't been around in awhile and they pulled his merchandise off the table, so he'd be selling shirts out of the trunk of his car after the show. He continued that even though WWE Superstar head to Raw and SmackDown, they all started in NXT, and thanked the fans. - Earlier today, Goldust tweeted out that ten years ago today he began his sobriety from drugs and alcohol. Goldust wrote, "Today is an important day for me. X yrs ago I was on death's door while drugs and alcohol consumed my everything. But, by the grace of God, I survived. Sobriety is the most important thing in my life, and I am proud of me."